Maybe it’s my undying love for radio broadcasting that inspires my interest in its history and early beginnings, and after spending over 40 years in broadcasting, I was recently surprised to learn that the first radio station broadcast in America, maybe the world, happened in downtown Toledo in the year 1907, many years prior to those early days of radio broadcasting in the 1920’s when stations in Detroit and Pittsburgh were going “on the air” and claiming they were radio’s first on the air. Not really. The real “first” in wireless radio, or telephony as it was called then, occurred in Toledo. Here’s the story, as I have pieced together from numerous news articles written over the years. This particular chapter in both the history of Toledo and radio, unfolded during the heat of a rabid race by many inventors to explore this new technology called “wireless”. Most of those inventors of the day were still testing how “wireless” could be used as a way to communicate using telegraph as the primary communications vehicle. The notion of actually transmitting a human voice and receiving it “through the air”, without wires, was beyond the boundaries of even the most fertile imaginations. But great innovations require great dreams and many of those early dreams were pursued in downtown Toledo. 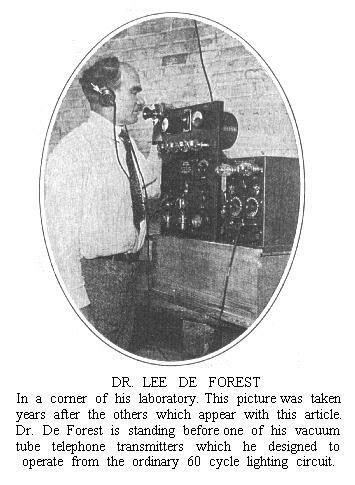 In a news article written by the NEA news service in 1925, Lee DeForest, considered the “father” of wireless broadcast radio, found himself in Toledo in the summer of 1907 and it was here that he made his first real breakthroughs in his quest to find a way to send voices through the air. A task he probably couldn’t have done without the help of a Northwest Ohio man and fellow believer, Frank E. Butler. Butler, had been a train dispatcher and telegrapher for the New York Central railroad in Toledo. But Frank Butler also had a passionate interest in the possibilities of this new technology of “wireless communication” and conducted his own experiments to see where they might lead. He wanted to do more than just tinker and wanted to leave his job and go to work with the renowned “wireless” pioneer Lee DeForest. He would write in later years that everyone thought it was mistake for him to leave his good paying job with the railroad to pursue these electrical dreams with DeForest, but his passion couldn’t be ignored. 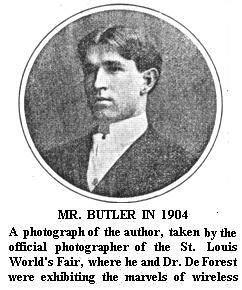 Butler join DeForest at the St. Louis World’s fair in 1904…where DeForest had set up a popular exhibit demonstrating to people and potential investors just how telegraph signals could be broadcast without wires. This was new abstract territory for most minds to comprehend and many who saw the DeForest wireless telegraph machines work, were still skeptical and thought it was fake. Butler, however knew better, he not only understood the technology, but also grasped the enormous potential of this new “science” and what it could mean to the world. Butler struck up a friendship with DeForest and began working as his chief assistant. Shortly thereafter, he traveled with DeForest to Florida and Cuba to set up wireless telegraph stations for the U.S. Navy between Florida and Guantanamo Bay Cuba. After the Navy contract was completed, Lee DeForest,however, found himself in a legal tangle with his investors and was kicked out of his own company, American DeForest. He was left on his own to chase new horizons for this technology. Undaunted by this turn of events and a lack of funding, DeForest and Butler were determined to pursue the idea of electrically sending the human voice through air without wires. To achieve that end, DeForest had developed the so called “Audion Bulb”, a crude two element vacuum tube of sorts, which allowed him to detect or amplify a radio signal. Butler and DeForest then built two crudely designed sending and receiving units and in July of 1907 took them to Put-in-Bay at South Bass Island on Lake Erie to an annual yacht race. This race would become their first real test. DeForest placed the transmitter on the 75-foot yacht, “Thelma”, renamed the “Electra” for the race, and set up the receiving unit on shore near what is now the Jet Express dock. Frank Butler later recalled that because the yacht had a mahogany hull, he and DeForest , snuck onto the boat and nailed two sheets of copper to its sides to help give it a better ground system when the copper was submerged in water. It worked. As the race progressed, DeForest was able to send to Butler, who was back on shore, voice accounts of the race as it was taking place, thus making the first “ship to shore” radio voice transmission in the world. News of this broadcast “first” was greeted with much skepticism and indifference by the media and the rest of the world, who perhaps thought this was just exaggeration and fakery. Butler and DeForest, however, were convinced that success of wireless voice communication was now at hand. Without any income, however, the two men needed a place to do their experiments. Butler convinced the inventor DeForest that they should go to Toledo where Butler’s in-law’s would give them a roof over their heads and give them a place to live and eat. Butler had already rented space from the Spitzer family, securing the roof of the Nicholas building in downtown Toledo, so they would have a place to experiment and continue their work. The race to radio’s future was running at full speed high above Toledo’s downtown streets as DeForest and Butler designed and built even more radio sets in that summer of 1907. They set up laboratories in both the Nicholas and Ohio Buildings downtown, often broadcasting music from an old phonograph when they weren’t talking between the two buildings in downtown Toledo. In one innovation milestone, noted in the Toledo News Bee in August of 1907, the two men also achieved the first “phone patch” communication with their system, as DeForest talked with Butler’s mother-in-law Julia Manning from their home at 818 Collingwood. In a phone call between the Old West End home to the Ohio building.. Butler held up the phone receiver to the microphone so she could talk with Lee DeForest, at the Nicholas Building via the radio signal. A small achievement, with big significance. As DeForest and Butler continued showing the world what they could do, success and recognition would follow. In a 1925 interview with Butler, who was then working as a sporting goods and radio manager for a store in Toledo, he said that after the Toledo experiments, Lee DeForest got a large order for 40 wireless radio sets for the U.S. Navy to be used in the fleet of Admiral Bob Evans for a round the world cruise of naval vessels, so they could be connected with voice communications. There would be many more orders and new breakthrough and even more recognition for DeForest. The rest, as they say, is history. DeForest would go on to become known as the “Father of Radio”, while Butler would eventually live out his life in Toledo in relative obscurity. He did form the American Wireless Institute and did write numerous articles about his years with DeForest which he treasured for the rest of his life. Radio, would of course, have a profound effect on the world. It still does. It was the “Internet” of our grandparents age and a miracle of communication that would change every facet of life and how we perceive it. It brought the voice of the world to our living rooms and to our minds. Today, 105 years after the summer of 1907, when radio history was made in Toledo, the Nicholas building, still stands, Lee DeForest remains a giant in radio history, a special sign commemorates the first “ship to shore broadcast” at Put-in Bay, and Frank E.Butler, who died in January of 1948 at the age of 71, is remembered only by a few, as the young man, who dared to live a dream that changed the world.